My little green corner of the earth and my deck, is coming along nicely. Here are the gnome boxes. I've had some hit and miss with the sweet potato vine over the years. What you can't see, and I'll try to take a close up photo of it, is that the edges of these vines are outlined in what looks like a red. 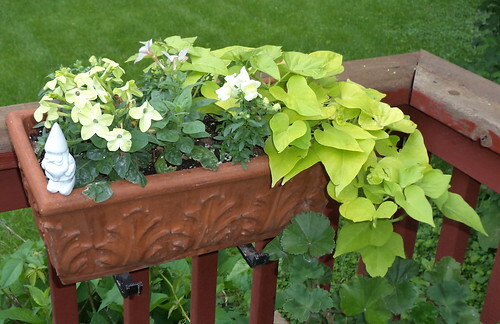 It is very distinctive and adds quite the dimension to the color of the plant. 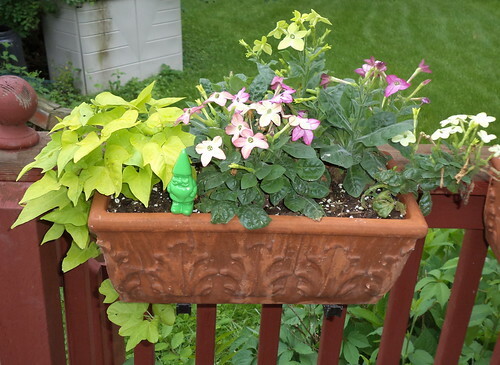 I'm going to have to rearrange the pots under the white gnome as that vine is falling on top of the pink geranium below it. What I'm most excited about is this. That's quite the curly que for a banana pepper but I'll take it. I noticed this morning there is another growing next to this one. 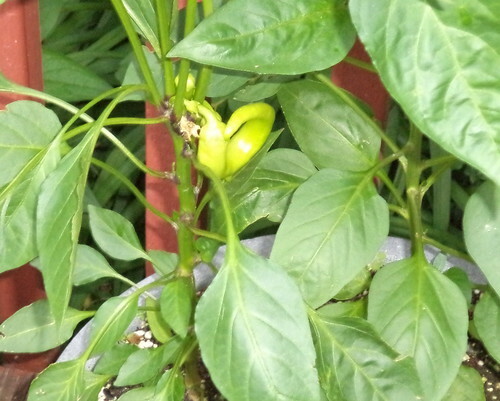 We are to have hot weather this weekend and peppers love hot weather. The ones I started from seed and then one seed I added to the pot from a pepper I got at the store are doing well too. I have had to water the deck flowers several times. They dry out quickly. The rest have gotten a watering from me just once. We've had enough rain that I haven't needed to water. Everything is doing well. It's so pleasant to be outside and sitting on the deck amongst the flowers.